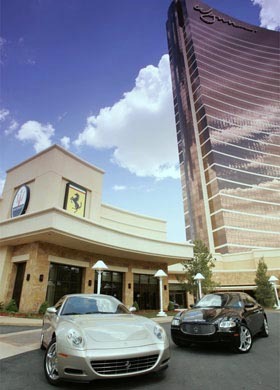 Wynn Las Vegas was the first resort to include a luxury car dealership. Brand new factory-authorized cars include the Ferrari and Maserati brands. Used cars are sold “as-is” and include other luxury car brands, with some cars on display ranging in price from little more than $100,000 to $1.6 million. The dealership also includes parts and other car-wares.